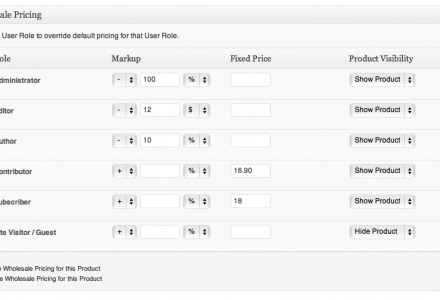 Wholesale Pricing for WP e-Commerce uses custom User Roles to apply different pricing levels against preferred customers (e.g. Subscribers, Wholesalers, Staff, guests/site visitors, etc.). 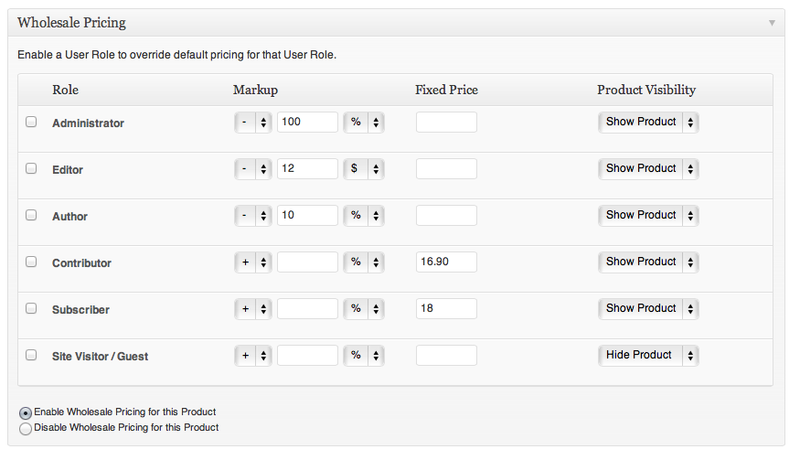 You can now bulk import/export Wholesale Pricing per-Product rules with Product Importer Deluxe. Looking for support, a copy of the readme, Plugin updates, Ideas or usage instructions? Check out our Documentation for Wholesale Pricing. does this plugin support shipping options to be setup based on the user group? I select the individual Product’s pricing levels at the products edit page. The fixed price is 0.00 in the widget (as default set), and this value always overwrite the percent based pricing. E.g. : I set -10% discount, but the wholesale product price will 0.00. I can’t use the bought plugin, please send a solution asap. I am evaluating purchasing the wholesale pricing plugin. Currently, I am using woocommerce . Willyour plugin work with different Product variations based on user type ? For example, will it allow showing certain product variations to wholesalers only, and other variations to retailers only ? Will this be available for WooCommerce? Hi! I am in the process of building a site using WP e-Commerce and we need to display wholesale pricing (based on user roles). Will this plugin integrate with the existing admin without the need to rebuild our product database? Hello, this is an very good plugin. We have a small issue, our custom template is using wpsc_cart_single_item_price to get the unit price and wpsc_cart_item_price the total price of the product on the check out page, and this is not the whosale price, any idea how can we fix this? I have another suggestion. Can we prevent coupon codes from being applied if the wholesale price is used during a checkout? Is there a validator check you could add into the plugin? I purchased this plugin over the weekend and I’m just going through some testing. Something occured to me, which I feel will be beneficial as a feature to this superb plugin. After the purchase goes through at the discounted price, the purchase/order history shows the details without flaw. However, it does not log or show anywhere what discount was used, if any was used, on the order history. I know the plugin works in a certain way and only involves itself with the discounted calculation of the product, but could there be an opportunity here to show the type/amount of discount given (i.e. Wholesaler 20%) somewhere like the order history on either the front or in the backend? This would certainly help to understand what the full price of the product (exc discount) was at the time of purchase – in case the price has changed since. Hi Anis, thanks for your suggestion. I’m not sure how we’d impliment that as we’d then need to save the wholesale pricing rules against the sale incase the store owner updates the rules after a Sale is made. I’ve added a note to look into this further, be it a simple note in the Sales log through to additional Sales meta once we move to Custom Post Type for Sales. Not a problem. Would be a nice to have for sure. For one my client website, I have WP e-commerce and Gold cart installed. All products and coupon are already there. The clients now wants a dedicated link for each distributor. Ability for a distributor to order online at the wholesale price and reports on same. Will your plugin help me to accomplish this requirement. Let me know at your earliest. – Ability for a distributor to order online at their wholesale price and this price is shown on reports, sales, etc. – Create a dedicated link for each distributor, our Plugin adjusts the Price an Sale Price of a Product based on the logged-in User Role. To get around your dedicated link issue make the Products Page and other cart pages restricted to logged-in users only so that once they log in they see their individual prices. Hope this helps. Hi, I’ve been able to install the plugin and successfully able to set wholesale price for user role. It is showing the price in product page. But when I added to the cart and trying to checkout, it shows the original price not the discounted price. I’m using WP e-commerce and Gold cart. I tried enable and disable checkbox in Setting->WholeSales Price->Pricing Settings for user roles, but nothing works to update the checkout pricing. It will be great if you can let me know the way forward. Hi I have a site with three levels of pricing, retail, wholesale and web. I am using groups to assign my customers to their pricing levels. 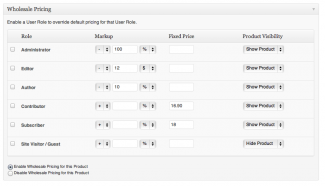 But I’m wondering if this plugin may help streamline the process for inputing the prices? Hi bredane, yes our Plugin will help with managing per-Product pricing based on different groups (we group based on User Role). Once you have created some new User Role’s within the WordPress Administration; e.g. Retail, Wholesale you can assign either storewide markup/markdown pricing rules against them or assign per-Product pricing rules from the Add/Edit Products screen. To help with per-Product pricing on large Product catalogues you can use our Product Importer Deluxe and Store Exporter Plugin to import/export Wholesale Pricing changes. Michael, please help me. I’m trying to get the updated plugin. Your Session ID was successfully verified, your latest Plugin files are listed below. No downloadable Products are linked to this Product. Hi jimario, I’m overhauling Download Manager today on our site to resolve this, there’s legacy sales that are causing the platform to be unstable. I have a over-all settings page discount of 10% that works fine. I have fixed price set in some products with variations for wholesaler users. That does not seem to work. If the main product has no fixed discount set no discount shows no matter what the variations say. If I set the main product discounted price to that of the cheapest variation, say $6, then all variations show $6 no matter what is set in the variation. Percentage discount and $ discount seem to be working fine. Fixed price not at all. I emailed via premium support but have heard nothing. Hi Mark, managing support via Plugin pages has meant some threads go unanswered. We’re changing this with the new Theme for our website next year. I’ll review your responses here and update you, can you please get in touch via the Contact page with site URL, FTP and WP Admin and I’ll act on this ASAP. I have a client who wants to have the layout of the Retail pages/products different than the layout of Wholesale pages/products. Essentially, the retail pages are going to be more visually focused with a lot more interactivity where the Wholesale pages are going to have a lot less information. How does this plugin handle the output for the different Retail/Wholesale users? Is there some type of class added or php variable passed that I can hook into to deliver different visual content based on who is logged in? Hi Gary, you can use the Wholesale Pricing template tag wpsc_wp_is_product_visible() to control visibility of individual Products per User Role, because this is a template tag you can hide the whole Product – by wrapping it around the WP e-Commerce template files within wpsc-single_product.php and wpsc-products_page.php – or individual elements (e.g. show Price for Wholesalers and perhaps display a Contact form for site visitors (guests). I’m a newbie. Could you please explain how to do this, in detail? Thank you so much for your help. I have completed the steps listed in the readme.txt file. However, the wholsesale product I wished to make visible to wholesale accts only remains visible ( http://geffenbaby.com/products-page/ ). I am using the Flexishop theme. Though I’m sure you’re busy with the many requests for help you recive here, the matter is rather urgent. I would appreciate any help you might offer. If I am not using WPEC (But the plugin is installed) and I just want to have a Wholesale page for customers with approved login to view pricing and submit orders (less the checkout process/as we invoice after) is there a way to do this with your plugin or otherwise/custom? Hi Kitty, so I understand you are using WP e-Commerce as a catalog site without the Checkout functionality. How did you plan for these wholesale Users to submit orders? You could use our Product Enquiry Plugin to add an enquiry form to the Product detail view, alternatively you could use our Manual Ordering Plugin to enable store owners to generate Orders from within the WordPress Administration but this would require capability changes to restrict this. Thanks for hte fast reply! We have an inquiry form already but would like to be able to send them a user/pass where they can see pricing/wholesale (not viewable by public) and enter an order of which we would then bill them manually Since most are Net Terms. Does this make sense? We have mods like it on another cart we use but are moving towards WP for all. If you have my email feel free to PM me! Wholesale Pricing comes with a Quick Start document (readme.txt) to help with installing the Plugin. Additional support can be found from the Contact page or methods below.